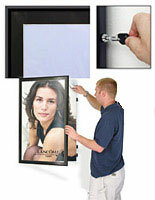 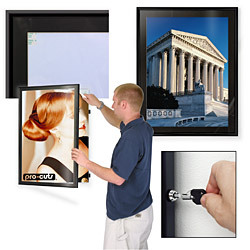 Post new advertisements, prints or artwork in less than a minute in these tamper resistant locking poster frames. 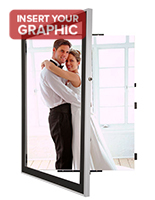 Hidden hinges allow the 0.5" wide satin black aluminum frame to swing open giving you access to make changes quickly. 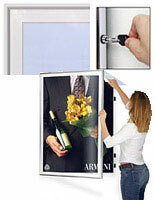 A plunge lock provides security when the poster frame is closed. 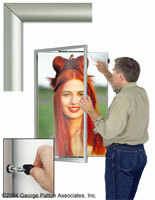 Metal hinges attach to an inner frame that mounts to the wall with the included hardware and provides support when the outer frame swings open. 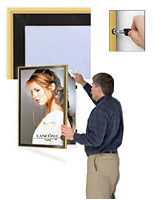 The outer poster frame contains a black matboard and a clear acrylic lens to protect your prints. 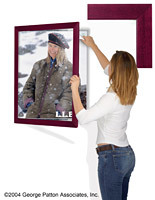 Prints up to 0.19" thick can be mounted to the supporting duraplast backboard using the included reusable/removable mounting tabs which make replacement a snap. 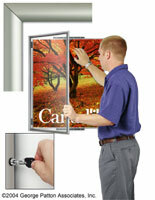 24.0" x 30.0" x 1.5"